Ahead of Week 11’s games, the Giants ranked 16th in both ESPN’s NFL Power Rankings and Football Outsiders’ Defense-adjusted Value Over Average, and their 6-point home win against a bad Bears team is unlikely to move those needles. And even after Sunday’s win, the Giants rank only 17th in FiveThirtyEight’s NFL Elo ratings. In 2007, New York was 7-3 through 10 games but imploded in the team’s 11th game. Against Minnesota, Eli Manning threw three pick sixes (he would finish the year with 20 picks, tied for the league lead). In 2011, the Giants through 10 games had scored 228 points and allowed 228 points, leading to a 6-4 record. At the time, neither of those teams seemed very noteworthy, and they finished with 10-6 and 9-7 records, respectively. Our current simulations have this year’s Giants finishing with 9.9 wins, which would put them right in line with those other good but not great Giants teams. In 2007, the Giants’ passing attack through 10 games wasn’t very good (and it would only get worse: The team finished the regular season at 22nd in adjusted net yards per attempt and 24th in passer rating). The running game (more on this in a minute) is what powered the team. But Eli Manning had some of his best games in the playoffs, particularly in the first two games. In 2011, the Giants were defined by the passing offense: Manning had one of his best seasons, teaming with wide receivers Victor Cruz and Hakeem Nicks. Manning again played better in the postseason, particularly in the early rounds. This year? Despite highlights from Manning and Odell Beckham Jr. and the success of rookie Sterling Shepard, the Giants have had a mediocre passing attack. They rank 19th in passing EPA and 16th in ANY/A. 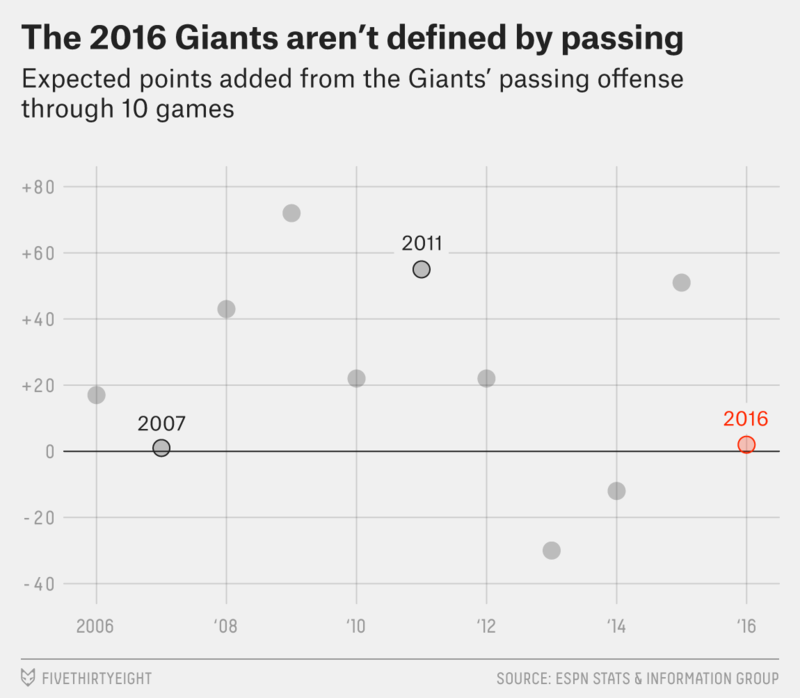 There’s obvious upside with Manning and Beckham, but if the Giants go on a Super Bowl run, the data suggests that the passing offense won’t be behind it. In 2007, the Giants’ offense was centered around Brandon Jacobs and Derrick Ward, with spot appearances by Reuben Droughns and rookie Ahmad Bradshaw. The ground game ranked fourth in yards and yards per carry. But even though the Earth, Wind and Fire Giants carried over their rushing success into 2008, the running game has been more of a weakness than a strength in more recent years. In 2011, the Giants finished dead last in both yards and yards per carry. 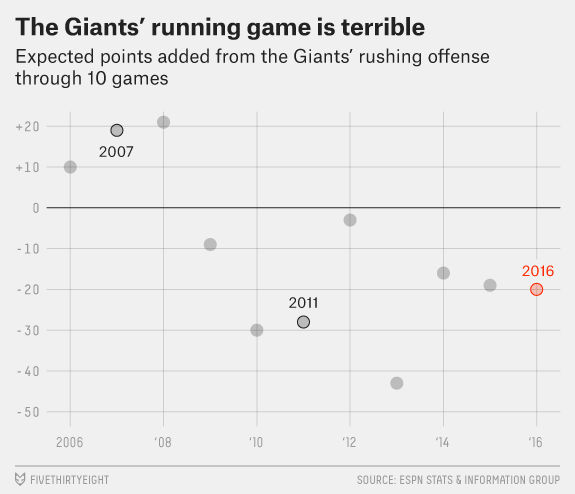 And once again, the Giants can’t seem to piece together a running game. This season, New York ranks 31st in yards and 30th in yards per carry, with the underwhelming Rashad Jennings the leader in an unimpressive committee. The veteran back is averaging an anemic 3.40 yards per carry, 38th out of 43 qualifying rushers. With this year’s Giants featuring a mediocre passing game and a bad running game, you’ve probably figured out that it’s not the offense carrying the team. The most enduring image of the 2007 Giants is likely the beating that the team gave Tom Brady and the undefeated New England Patriots, but it’s easy to forget that through 10 games, that team was below average against the pass. Same goes for the 2011 version, which was among the worst teams in the league at defending the pass until it got its act together down the stretch. Last year, the pass defense was the Giants’ downfall — the team ranked 28th in EPA and 29th in ANY/A allowed, factors that led to the team finishing 30th in points allowed and last in yards allowed. The Giants finished 6-10, with opposing quarterbacks leading five fourth-quarter comebacks against them and a sixth loss involving another blown lead in the final minute. 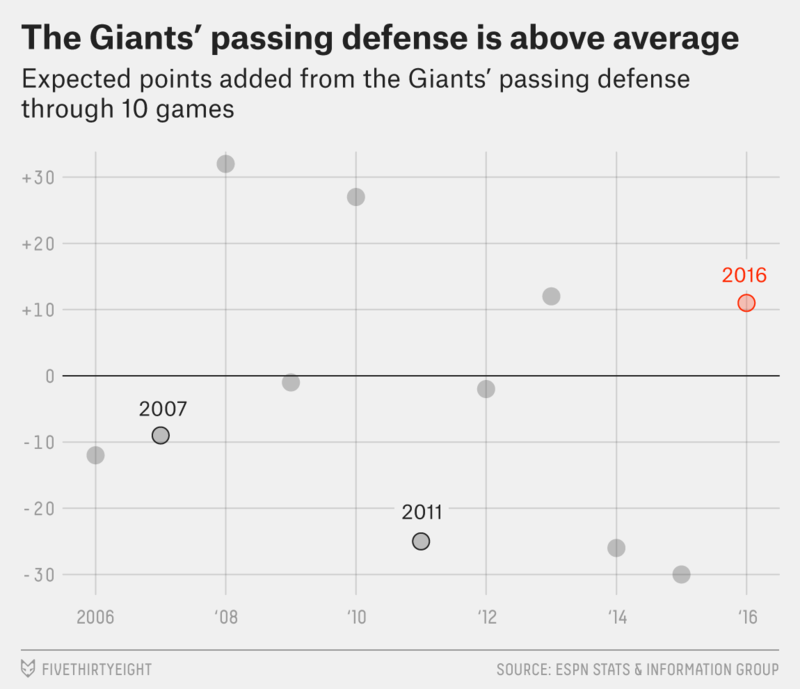 In the offseason, the Giants spent a ton of money to improve the defense. The team re-signed Jason Pierre-Paul; added Olivier Vernon, Janoris Jenkins and Damon Harrison; and drafted cornerback Eli Apple in the first round. Those additions have paid dividends, and safety Landon Collins, selected 33rd overall last year, has been a huge part of the team’s turnaround. This year, the Giants rank eighth in pass EPA and fifth in ANY/A allowed, and the pass defense is the strength of the team in a way it hasn’t been in years. The 2007 and 2011 Giants were both strong against the run, but this year’s squad is even stronger. The Giants currently rank eighth in rushing yards allowed per game and fifth in yards per carry allowed. The additions of Harrison and Vernon have transformed the defensive line, after the defense ranked in the bottom half of the league in most rushing categories last year. 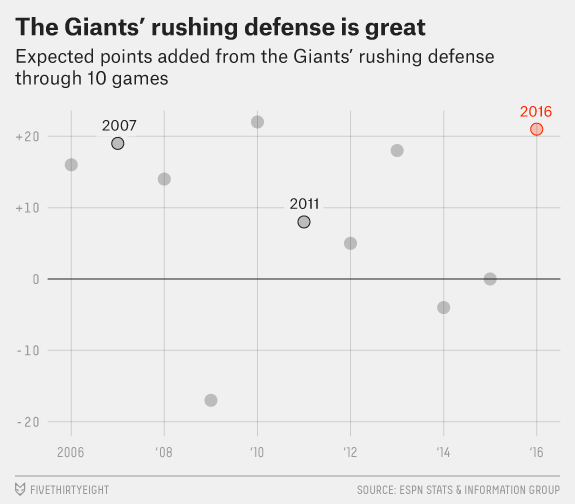 The defense is the clear strength of this year’s Giants team, and it’s in a better position through 10 games than the defenses were during those Super Bowl-winning seasons. That’s a good thing, because unlike in those championship seasons, Eli Manning and the Giants offense are playing at or below league average — not exactly in position to carry a team on a late-season winning streak. So if the Giants make a run for the Super Bowl, it may be less likely to resemble Eli Manning’s two Super Bowl teams and more likely to resemble Eli’s brother’s team last year. The Giants have played six games at home; they also played one game in London, against the Rams. The first year for which we have EPA data. And while EPA does not adjust for era, we have adjusted those numbers on a per-play basis to account for those differences. I took an average of the per-play EPA for passing and rushing plays from 2006 to 2016 and then adjusted each season of team EPA data based on how the per-play average in a given season differed from the per-play average overall.